Each year biologist Ron Pittaway releases his "Winter Finch Forecast" which fairly accurately predicts the likelihood that northern finches will be moving farther south over the winter. His report sounds as if we'll probably be seeing some interesting birds this winter. 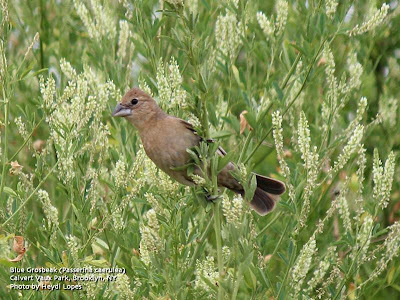 The theme this winter is that each finch species will use a different strategy to deal with the widespread tree seed crop failure in the Northeast. It will be a quiet winter in the eastern North Woods. See individual species forecasts for details. Both coniferous and hardwood tree seed crops are generally poor from northeastern Ontario extending eastward across Quebec to Newfoundland south through the Maritime Provinces, New York and New England States. Within the Northeast there are pockets of good crops. Cone crops are much better in the Hudson Bay Lowlands and northwestern Ontario west to Alberta, Northwest Territories and Yukon. Three irruptive non‐finch passerines whose movements are linked to finches are also discussed. PINE GROSBEAK ( map ): A good flight is expected into southern Ontario because the mountain‐ash berry crop is variable in the boreal forest. Many berries are hard with low moisture content because of the drought. The European mountain-ash and ornamental crabapple crops are poor to fair in southern Ontario so these crops won’t last long. Grosbeaks will be attracted to the usually abundant buckthorn berries and to bird feeders offering black oil sunflower seeds. The Ontario breeding population of this grosbeak is stable. PURPLE FINCH ( map ): Most Purple Finches will migrate south of Ontario this fall because both coniferous and deciduous hardwood seed crops are very low this year in the Northeast. Purple Finch numbers dropped significantly in recent decades as spruce budworm outbreaks subsided and currently a moderate population decline continues in the province. RED CROSSBILL ( map ): Red Crossbills comprise at least 10 “types” in North America. Each type probably represents a separate or newly evolving species. Most types are normally impossible to identify in the field without recordings of their flight calls. Matt Young of The Cornell Lab of Ornithology reports that there is currently a large early irruption of Type 3 Red Crossbills (smallest billed type) from the west into eastern North America. Recordings can be made with a cell phone and sent to Matt to be identified (may6 AT cornell.edu). Every recording adds an important piece to the puzzle, especially when accompanied by notes on behaviour and ecology, including tree species used for foraging and nesting. Matt emphasizes that the conservation of call types depends on understanding their complex distributions and ecological requirements. WHITE-WINGED CROSSBILL ( map ): With very poor spruce cone crops in the Northeast, most White-winged Crossbills will likely stay this winter in the Hudson Bay Lowlands, northwestern Ontario and western Canada where spruce cone crops are generally very good. They will be virtually absent from traditional hotspots such as Algonquin Park where spruce crops are very low. Wandering birds may show up throughout the Northeast. COMMON REDPOLL ( map ): There should be a good southward flight because the white birch seed crop is poor to fair across the north. Watch for redpolls on birches and in weedy fields and at bird feeders offering nyger (preferred) and black oil sunflower seeds. Check flocks for the rare “Greater” Common Redpoll (subspecies rostrata) from the High Arctic. It is reliably identified by its larger size, darker and browner colour, longer/thicker bill and longer tail in direct comparison to “Southern” Common Redpolls (nominate flammea subspecies). Note: The notion of a “biennial periodicity” that redpolls irrupt south every second winter is not supported by records in Atlantic Canada (Erskine and McManus 2003). The authors concluded that "irregular abundance but near-annual occurrence" of redpolls in the Atlantic Provinces is a better explanation than a two year cycle. Similarly redpolls were recorded on 32 of 38 Christmas Bird Counts in Algonquin Park (Lat. 45.5 N), Ontario. HOARY REDPOLL ( map ): Check redpoll flocks for Hoary Redpolls. There are two subspecies. Most Hoaries seen in southern Canada and northern United States are “Southern” Hoary Redpolls (subspecies exilipes). “Hornemann’s” Hoary Redpoll (nominate subspecies hornemanni) from the High Arctic was previously regarded as a great rarity in southern Canada and the northern United States. In recent decades a number have been confirmed by photographs. Hornemann’s is most reliably identified by its larger size in direct comparison to flammea Common Redpoll or exilipes Hoary Redpoll. Caution: White birds loom larger than life among darker birds and size illusions are frequent. PINE SISKIN ( map ): Some siskins currently in the Northeast should move south this fall and winter because cone crops are poor. However, siskins are an opportunistic nomad wandering east and west continent-wide in search of cone crops. Most siskins will probably winter in northwestern Ontario and western Canada where cone crops are generally very good. Major southward irruptions occur when cone crops fail across most of North America. EVENING GROSBEAK ( map ): This spectacular grosbeak is ABA’s Bird of the Year in 2012. We can expect some at feeders in central Ontario and probably elsewhere in the Northeast because coniferous and hardwood tree seed supplies are low. Highest breeding densities are found in areas with spruce budworm outbreaks. The larvae are eaten by adults and fed to young. Current populations are much lower than several decades ago when budworm outbreaks were much larger and more widespread. THREE IRRUPTIVE PASSERINES: Movements of the following three species are often linked to the boreal finches. BLUE JAY ( map ): Expect a smaller flight than last year along the north shorelines of Lakes Ontario and Erie because the red oak acorn crop is very good in central Ontario. Beechnut and hazelnut crops were poor to none, but the acorn crop may be large enough to keep many jays in the north this winter. RED-BREASTED NUTHATCH ( map ): A widespread irruption of this nuthatch beginning in mid-summer indicated a cone crop failure in the Northeast. Most will leave the eastern half of the province for the winter, but some will probably remain in northwestern Ontario where cone crops are much better. BOHEMIAN WAXWING ( map ): Expect a flight this winter because the mountain‐ash berry crop in the boreal forest was affected by drought. Even though some areas have large crops, many berries are hard with low moisture content. Farther south Bohemians will be attracted to the usually abundant buckthorn berries because European mountain‐ash and ornamental crabapple crops are generally low and of poor quality. WHERE TO SEE FINCHES IN ONTARIO: Algonquin Park is a winter adventure about a three hour drive north of Toronto, but this will be a very lean finch winter in the park. Conifer crops are poor to none. Feeders at the Visitor Centre (km 43) should have Pine Grosbeaks, Evening Grosbeaks, and redpolls. The Visitor Centre and restaurant are open weekends in winter. Arrangements can be made to view feeders on weekdays by calling 613‐637‐2828. The nearby Spruce Bog Trail at km 42.5 and Opeongo Road are good spots for Gray Jays, Boreal Chickadees, Spruce Grouse and Black‐backed Woodpeckers. Be sure to get a copy of the new “Birds of Algonquin Park” (2012) by Ron Tozer. It is one of the best regional bird books ever published with lots of information about winter finches and boreal specialties. WINTER FINCH BASICS: A primer about finch facts, seed crops and irruptions. Excellent paper on berry crops in Ontario. ACKNOWLEDGEMENTS: I thank staff of the Ontario Ministry of Natural Resources designated by an asterisk* and others whose reports allow me to make annual forecasts: Dennis Barry (Durham Region), Eleanor Beagan (Prince Edward Island), Pascal Cote (Tadoussac Bird Observatory, Quebec), Bruce Di Labio (Eastern Ontario and Churchill, Manitoba), Carolle Eady (Dryden), Cameron Eckert (Yukon), Marcel Gahbauer (Alberta & Northwest Territories), Michel Gosselin (Canadian Museum of Nature), David Govatski (New Hampshire), Charity Hendry* (Ontario Tree Seed Facility), Leo Heyens* (Kenora), Tyler Hoar (Northern Ontario & Quebec Laurentians), Jean Iron (Hudson Bay, James Bay & Northeastern Ontario), Bruce Mactavish (Newfoundland), Brian Naylor* (Nipissing), Justin Peter* (Algonquin Park), Genevieve Perreault (Regroupement QuebecOiseaux), Fred Pinto* (North Bay), Harvey & Brenda Schmidt (Creighton, Saskatchewan), Ron Tozer (Algonquin Park), Declan Troy (Alaska), Mike Turner (Haliburton Highlands), John Woodcock (Thunder Cape Bird Observatory) and Kirk Zufelt (Sault Ste Marie, Ontario). I especially thank Matt Young of The Cornell Lab of Ornithology for advice and detailed information about seed crops in New York and adjacent states and for information about Red Crossbills. Jean Iron proofed the forecast and made helpful comments. LITERATURE CITED: Erskine, A.J. and R. McManus, Jr. 2003. Supposed periodicity of redpoll, Carduelis sp., winter visitations in Atlantic Canada. Canadian Field-Naturalist 117(4):611-620. It's been a little while since I've posted any of my recent birding summaries. I'll try and get you up to speed in this write up. Migration has been progressing with subtle changes in the groups of birds passing through the city. Warbler diversity has dropped off noticeably with other families of birds seen on the rise. 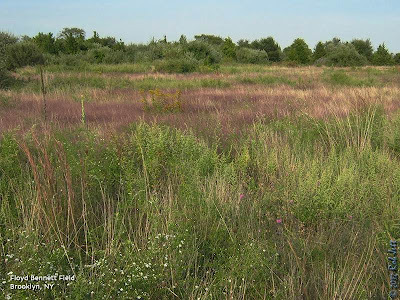 The grasslands and community gardens at Floyd Bennett Field is a great spot to begin looking for migrating American Pipits, sparrows, Dickcissels and Bobolinks. This is a perfect time to start searching for them and, with a little luck, I thought I should be able to track some down. Heydi had already been walking around Floyd Bennett for a couple of hours when I arrived and joined her. One of my main target species was Bobolink and the grassy habitats here is the best place in Brooklyn to find them. The cricket field in the north-west corner of the property is edged with grasses, mugwort, goldenrod and various other forbs. A perfect spot for this at risk species. The grass on the field is regularly mowed and very short, however, the western border and a berm to the north has been left wild leaving a dense, tall growth of bird habitat. We walked over to a spot parallel to the bicycle path that is outside the park and I "pished" loudly. 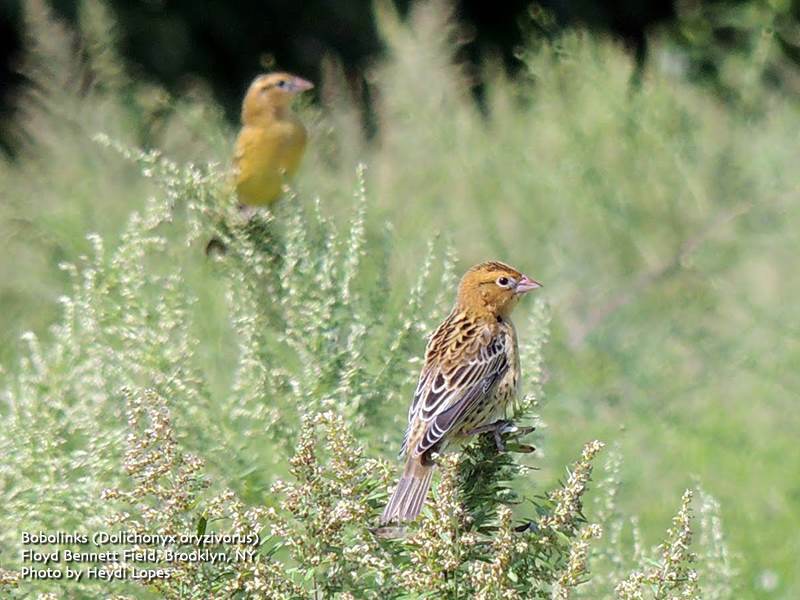 A small flock of Bobolinks immediately popped out of the underbrush and perched on top of a tall stand of mugwort. They were all females or non-breeding plumage males, that is to say, none were wearing the unique "backward tuxedo" of a breeding male. We spent a couple of more hours scouring the habitats for Dickcissel, Clay-colored Sparrow or anything unusual, but came up empty. It probably didn't help that work crews were constructing an obstacle course around the runways and on the "Buff-breasted Sandpiper" field for an upcoming event. 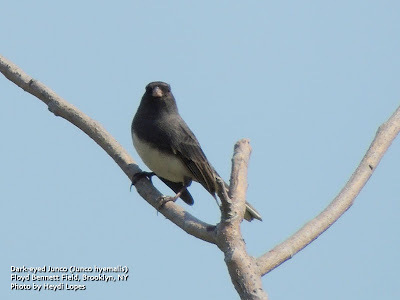 There also weren't a lot of migrating sparrows seen, although we did find a seemingly very early Dark-eyed Junco calling from a bare ailantus tree. A quick run across Flatbush Avenue to Dead Horse Bay was also unproductive. Regardless, I was happy to have seen some Bobolinks. I hadn't been to Dreier-Offerman Park, the peninsula that looks out at the Verrazano Bridge, since Fall of last year. It's another grassland habitat, although its proximity to Coney Island Creek and Gravesend Bay also made it a good spot to look for waterfowl and seabirds. The overnight wind conditions really weren't right for a good flight of songbirds and the south winds continued through the day. Any songbirds that had migrated into the area on the last cold front would likely still be in the area. 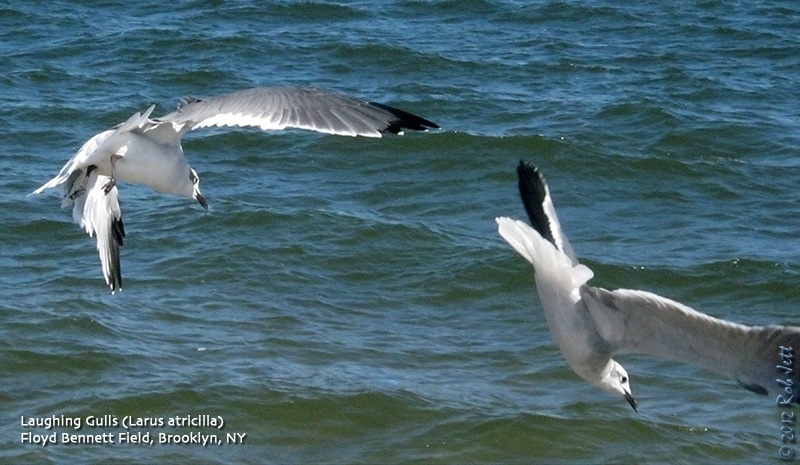 I also thought that a strong south wind could push some birds normally found on the ocean into the bays around the Coney Island peninsula. When I left the house it was still dark. Sunrise was about 30 minutes away and I wanted to get to Stillwell Avenue in Coney Island fairly early. My plan was to walk up to Cropsey Avenue, cross the creek and head over to Six Diamonds Park. 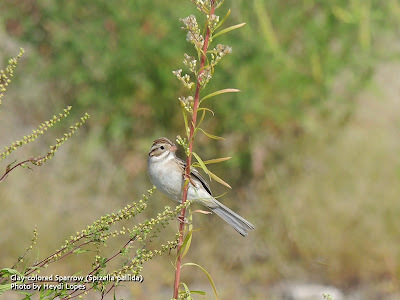 In addition to the grass ball fields, there is a border habitat at the edge of the Dreier-Offerman cove that attracts a variety of songbirds. On that morning, however, both areas were nearly devoid of birds. At Dreier-Offerman there were some early soccer games scheduled and players were already arriving by 7am. So much for finding birds on the fields. A weedy field to the north of the park proper yielded a handful of sparrows - mostly Savannah Sparrows - but there was also a single Lincoln's Sparrow in the mix. In my experience, this skulky, nervous little bird seldom gives one a chance at long study as it usually pops out of the brush for a brief moment before disappearing into dense grass. The bird on Saturday seemed a bit cranky and spent a lot of time chasing the other sparrows away from "his" feeding territory. After a disappointing low number of birds, Heydi and I headed off towards Coney Island to scan the water there for terns and other water birds. The entry into Dreier-Offerman Park is a temporary dirt road that looks more like a construction zone than a park. The two sides of the road are bordered by high chainlink fences that have plywood sheets affixed to the inside. Both areas are off limits to the public as "soil decontamination" is under way. The area on the south side of the road edges the cove. The area on the north side is a large field, not unlike the habitat in Floyd Bennett Field adjacent to the cricket field. As we were leaving we passed a section where the fence and plywood had been knock down, I stuck my head in and quickly scanned the tops of the dominating mugwort. A Blue Grosbeak was perched just inside the fence. It was an unexpected find and I had a difficult time finding the words "blue" and "grosbeak". I stuttered something incomprehendable, but Heydi somehow got the message and grabbed her camera. As she was taking photos of the grosbeak I spotted a small, pale bird flying across the field to the right of the it. I zeroed in on it with my bins and this time found the right words immediately - Clay-colored Sparrow! Clay-colored Sparrows are not just an incredibly beautiful little bird, they are hard to come by around New York City. A bird of mainly shrubby grassland, they are found almost exclusively migrating North and South through the central regions of the continent. 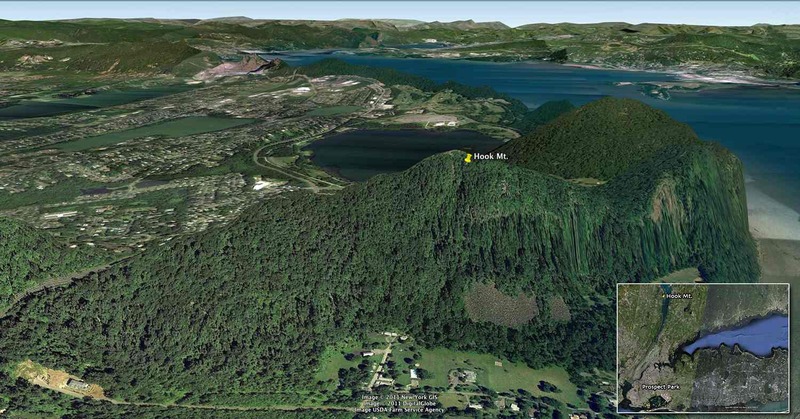 Cornell's eBird site has a great dynamic map that shows this distribution here. Each year during migration some individuals stray from that path and end up passing through New York City and vicinity. Why that is, I couldn't say, but I'm glad they do as they brighten my day on the rare occasion that I see one. I sent a text out to the Brooklyn alerts list and we continued towards Coney Island. A few minutes later we received a call from Shane, who was nearby and heading our way hoping to find the birds. I commented that he has good "Birding Karma" and if anyone could relocated them it would be him. And after a brief search of the field we managed to find both birds for him. It's always great finding a good bird, but I think a big part of the birding experience is being able to share it with others. The Linnaean Society of New York booked me to lead a trip to the Hook Mountain Hawk Watch, which is near Nyack, NY. Last year I went to the hawk watch on September 17th and that turned out to be one of the most incredible days on record for Broad-winged Hawk migration. I posted about it here. It is impossible to predict a year in advance which day will be the best for Broad-winged Hawks, but you pick a date in mid to late-September and keep your fingers crossed that the weather conditions and animals cooperate. I had eight people registered for the trip and I told everyone that overnight North-West winds looked good for a big push of hawks. Deep down inside, though, I knew it was very unlikely that we'd experience the thousands of hawks that I saw last year. The weather was clear with a slight cool wind blowing in from the North-West when we arrived at the mountain top at around 9am. A few hawkwatchers had already assembled. It was a slow morning with only sporadic sightings of individual broad-wings. We did see a fair number of Sharp-shinned Hawks and American Kestrels passing close to the ridge. There is a plastic Great-horned Owl mounted on top of a post designed to attract some of the raptors. A few sharpies dove at it, but the best performance was by a juvenile Red-tailed Hawk who looked like he planned on taking the faux owl's head off. While the broad-winged migration turned out to be a little disappointing the group did get some great looks at Bald Eagles. One pair of adult eagles delighted the assembled masses on the mountain top as they tussled with each other, first to our south, then as they passed overhead and out over the Hudson River. One very odd sighting from the hawk watch was a Savannah Sparrow. More appropriately seen at Floyd Bennett Field, the migrating songbird touched down briefly to rest, then continued on its way. If you've never been to a hawk watch I highly recommend it and Hook Mountain on the Hudson River is only about an hour drive from Brooklyn. In fact, you can see part of the city skyline from the top of the ridge. Comments: This was a Linnaean Society of New York field trip that I led. This week at Green-Wood Cemetery I noticed a profound change in the status and abundance of certain migrating species. A brief cold front moving through our area had brought with it large numbers of Northern Flickers and Blue Jays. In addition, the oak trees at the corner of my block are suddenly noisy with the squeaks and "chaaa"s of Common Grackles. Within a month the oaks will return to only the occasional House Sparrow or woodpecker. As I searched wooded edges and open lawns for sparrows I kept coming across small flocks of Yellow-rumped Warblers and Palm Warblers. Many of the palms were of the pale Western race of the species. Eastern Phoebes hawking for insects were also seen in good numbers for the first time this season. The cemetery's abundant flowering dogwoods are now fruiting and were magnets for flickers, tanagers, robins and other thrushes. There were a fair number of Chipping Sparrows around, but since they nest in the cemetery I wasn't sure if they were migrating birds or breeding populations that just haven't moved south yet. When chippings are moving through the area the cemetery can see very large flocks. The most I've seen there was several years ago when Marge, Doug and I estimated that there were 20,000 sparrows near the Hill of Graves. Another species that is currently heading south are Double-crested Cormorants and I spotted a flock of 62 passing over Green-Wood. I was hoping that they'd drop in for a short respite, but they would probably fill up the cemetery's small ponds. The forecast calls for the wind to switch to the North-North-West then North-West overnight and into the morning. These are the right conditions for Southbound migrants, so perhaps we will be seeing some good activity tomorrow morning. I'll keep you posted. 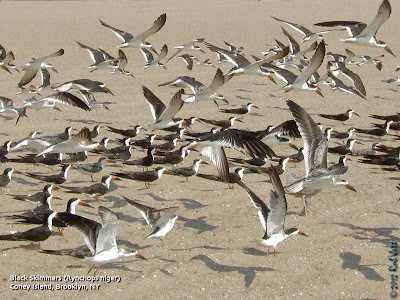 Coney Island beach, from the fishing pier to the Western-most jetty, is now a staging area for South-bound migrating Black Skimmers. On a recent trip I counted approximately 1000 of these tern-like birds. Most of these birds will winter in Mexico and Central America. My apologies to anyone who may have showed up for my trips this week to find me MIA. There was a death in my family and I had to go out of town at the last minute. For that reason I have changed my policy for the weekday tours. If you are planning on attending my Tuesday or Wednesday tours, please email me at least 24 hours in advance, that way I can contact you if there are any changes. Sprint Nextel Corp. is racing to build a complicated new coast-to-coast cellphone network. The carrier could move faster if it weren't for the birds. It turns out the same towers Sprint is rigging with high-speed wireless technology to compete with Verizon Wireless and AT&T Inc. are a favorite nesting spot for ospreys. The big fish-eating raptors favor high perches with a clear approach—exactly what network engineers look for when putting up cellular sites. An osprey nests atop a telecommunications tower in New Jersey. Throw in a flat top surrounded by railings, a typical design for cell towers, and you've got what looks like "nirvana to an osprey," said Eric Stiles, head of the New Jersey Audubon Society. The nests, basically just big piles of sticks, can be large enough to house a full-grown person and weigh up to half a ton. And once they have settled on a spot, ospreys are tough to evict. Dage Blixt, supervisory wildlife biologist with the U.S. Department of Agriculture in Virginia, advises companies on removing osprey nests. He knows firsthand how hard it can be. Mr. Blixt once cleared a nest only to be called back later after the persistent birds had reassembled their home using the same sticks. These days, when he dismantles a nest, he bags up the nesting material, drives it away in a truck and dumps it in the woods. "If they are going to rebuild, they are going to have to work for it," he says. Sprint's osprey problem is only the latest entanglement between big birds and big business. In 2004, the country's largest nuclear plant was knocked off line by a chain of events that officials said began with an unidentified bird on a transmission line and ended with blackouts across the Southwest. Oregon-based utility PacifiCorp, owned by Warren Buffett's Berkshire Hathaway Inc., had to pay out more than $10 million in fines and equipment fees after accidentally electrocuting hundreds of golden eagles on its power lines between 2007 and 2009. Now it is the telecom industry's turn. Ospreys have put their wings in the way as carriers are in the middle of rare, multiyear network upgrades—installation of a technology called LTE that promises superfast Web browsing. Demand for LTE service is expected to rise quickly after Apple Inc. touted the technology as a key attribute of its iPhone 5 unveiled last week. Verizon's LTE network already covers three-quarters of the U.S. population. But Sprint is just getting started, putting pressure on the company to work fast. The ospreys, protected by the federal Migratory Bird Treaty Act, have Sprint on hold at about 700 sites. The avian delays have become a running joke with Wall Street. At an investor conference Sept. 12, Sprint Chief Financial Officer Joseph Euteneuer went back and forth with Bank of America Merrill Lynch analyst David Barden over migrating birds. "A headwind?" Mr. Barden asked. "Yes, that's one of our bigger ones," Mr. Euteneuer replied, laughing. Ospreys sport wingspans of almost six feet and plunge dramatically into water to catch their prey. Shakespeare referenced their "sovereignty of nature" in "Coriolanus." Less celebrated is their reputation for being as stubborn as mules. The birds ignore netting strung around cell towers, return year after year after wintering as far away as South America to the exact same spot and are unusually unflappable for big birds of prey. Jeff Skriletz, district wildlife biologist for Washington State's Department of Fish and Wildlife, remembers a time in the late 1990s when state employees were called in after a train derailed into the Columbia River. Overhead, a pair of ospreys went about building their nest as cranes and other heavy machinery pulled rail cars out of the water. "In the heat of this panic repair with all this huge equipment hammering and smashing and maybe 100 people swarming around, the birds kept flying in with sticks right over this mob," he said. The real marvel, he said, came during a briefing for workers under the osprey nest. "They stopped and actually mated over the speaker's head," Mr. Skriletz said. "Talk about tuning out everything around you." CenturyLink Inc. had an osprey nest on a cell tower in Vashon Island, near Seattle, burst into flames for unknown reasons in June. The birds have since rebuilt their nest on the same location, a spokeswoman said. Ospreys were threatened by DDT but have rebounded since the pesticide was banned in the U.S. four decades ago. Even so, the Migratory Bird Treaty Act protects their nests, eggs and feathers, even on private property. Inactive nests generally can be removed in the fall. But some states like Florida, where the birds don't migrate south, have more stringent rules. As many as 45% of Florida's cellphone towers are home to osprey nests, contractor Bechtel Corp. estimates. Rick Friday, who runs Arkansas-based Friday Tower, recounted a surprise found by his crew in Louisiana. "They climbed up the tower and about halfway up, they realized there was a bird and babies on it," he said. "We left that site for three months." Carriers typically wait till the birds fly away for the season then try to dismantle the nest and keep them from returning. It is easier said than done. Bechtel puts up nets to keep ospreys away, but the persistent nesters just build on top of them. PacifiCorp tries to lure the birds away from their existing nesting sites by building nesting platforms. It uses old power poles and asks local Boy Scouts, as part of their Eagle Scout certification program, to build the plywood platforms. A PacifiCorp spokesman says the company builds about 50 a year. New Jersey issued its own guidelines earlier this year for dealing with nests on cell towers. Kathy Clark, a biologist overseeing the program at the New Jersey Division of Fish and Wildlife, says companies should pair deterrents on their towers with alternative sites for nests. Learn about the amazing birds of prey known as raptors. $25 to particpate and enjoy after-dark Canoeing in the Gowanus Canal along with a Buffet Dinner, educational programs including boating safety, ecology and history of the Gowanus Canal. There will be Live rock&roll and bluegrass, featuring the Fabulous Lee Reiser and Angel Band Jam. With Bayside Historical Society, Bayside Marina, Community Board 11, NYC Department of Parks and Recreation, Queens Botanical Garden, St. John’s University Environmental Studies Program Meet at Alley Pond Environmental Center, 228-06 Northern Boulevard, Douglaston, NY. 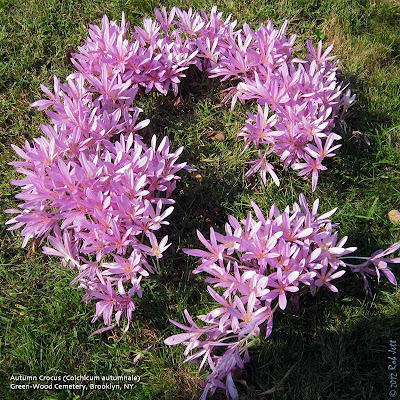 Come celebrate National Estuaries Day at Little Neck Bay. Festival activities will include canoeing, boat rides, NYC Audubon-led nature walks, games, music, and more. For more information, please call 718-229-4000. Guides: Cliff Hagen, Tod Winston Come visit some of the beautiful, bird-rich spots on Staten Island--which can be hard for car-less New Yorkers to get to. We'll start in the pristine marsh and beach habitat of Great Kills Park, looking for shorebirds and wading birds, and then move on to North Mount Loretto State Forest to look for migrant flycatchers, warblers, and more. Bring lunch, water, and binoculars. Transport by passenger van included. $65 Click here to register! Saturday, September 29, 2012, 2 p.m. to 4 p.m.
Past and present blend in the Conference House Park where history stretches back thousands of years with the seasonal occupation of the Lenape people and hundreds of years of the Dutch and English habitation. We’ll observe evidence of the human occupation of the area, observe local geology and discover what the natural and unnatural debris at the high tide line reveals. Meet at the Lenape Playground at the corner of Billop Street and Swinnerton Avenue. Greetings. This is the New York Rare Bird Alert for Friday, September 21st 2012 at 8pm. The highlights of today's tape are FORK-TAILED FLYCATCHER, AMERICAN WHITE PELICAN, WESTERN KINGBIRD, HUDSONIAN GODWIT, BAIRD'S SANDPIPER, RED-HEADED WOODPECKER, BLUE GROSBEAK, DICKCISSEL and pelagic trip results. Certainly the week's highlight was an adult male FORK-TAILED FLYCATCHER found Wednesday morning at the Oceanside Marine Nature Study Area, present until noon, when chased off by a Cooper's Hawk, the flycatcher was not relocated until late in the afternoon on an adjacent golf course. This is a private club but they did graciously allow birders on to view the bird. Searches of both the golf course, with permission, and the Oceanside Marine Nature Study Area on Thursday proved to be fruitless and the Fork-tailed has not been seen since Wednesday. In the city parks there was the expected seasonal variety of migrants this past week. Unusual in Central Park were an AMERICAN BITTERN continuing around Turtle Pond at least to Thursday and an EASTERN WHIP-POOR-WILL roosting daily in the Ramble from Saturday to Wednesday. Other Central Park highlights featured YELLOW-BILLED CUCKOO, OLIVE-SIDED FLYCATCHER Friday, YELLOW-BELLIED FLYCATCHER, occasional PHILADELPHIA and BLUE-HEADED VIREOS, GRAY-CHEEKED THRUSH, two dozen plus species of warblers including a PROTHONOTARY WARBLER reported Thursday plus CAPE MAY WARBLER, MOURNING WARBLER and HOODED WARBLER, a CLAY-COLORED SPARROW at the north end Sunday through today, some LINCOLN'S SPARROWS and briefly seen BLUE GROSBEAK and DICKCISSEL at the north end today. Hawks overhead have included scattered BALD EAGLES but the hawk flights have been much better at the inland ridges. A CONNECTICUT WARBLER was found Monday in Bryant Park joining such migrants as GRAY-CHEEKED THRUSH, LINCOLN'S SPARROW and a few species of warblers. CONNECTICUT WARBLER has also been reported elsewhere including at Alley Pond Park in Queens. Prospect Park has also enjoyed a good variety this week including OLIVE-SIDED FLYCATCHER, PHILADELPHIA VIREO and CONNECTICUT and HOODED WARBLERS and a BLUE GROSBEAK was spotted at Kissena Park in Queens Wednesday the same day finding a LARK SPARROW at Fort Tilden. At Jamaica Bay Wildlife Refuge the AMERICAN WHITE PELICAN was still present on the East Pond today along with an immature CASPIAN TERN and the shorebird highlight there was an HUDSONIAN GODWIT found at the Raunt last Saturday this bird not lingering. A deep sea pelagic trip last Sunday out of Freeport aboard the Star Stream VIII, a fine pelagic vessel, got out about 80 miles and the official trip tally featured 5 CORY'S SHEARWATERS, over 350 GREAT and 4 AUDUBON'S SHEARWATERS, 175 WILSON'S STORM-PETRELS and a single LEACH'S STORM-PETREL, 3 RED-NECKED PHALAROPES a BLACK TERN, one PARASITIC and 3 POMARINE JAEGERS and a few landbirds including NORTHERN FLICKER and PURPLE FINCH. Animal highlights were a continuously breaching Hump-backed Whale along with some Common and Bottle-nosed Dolphins. The coastal flight last Sunday produced 2 WESTERN KINGBIRDS and an adult RED-HEADED WOODPECKER at Robert Moses State Park and it may've been one of these Kingbirds also seen later in the median at Jones Beach West End. At the West End Saturday shorebirds on the bar off the Coast Guard Station included a MARBLED GODWIT, one BAIRD'S SANDPIPER, one PECTORAL SANDPIPER and 2 WESTERN SANDPIPERS and a flyover AMERICAN GOLDEN-PLOVER. 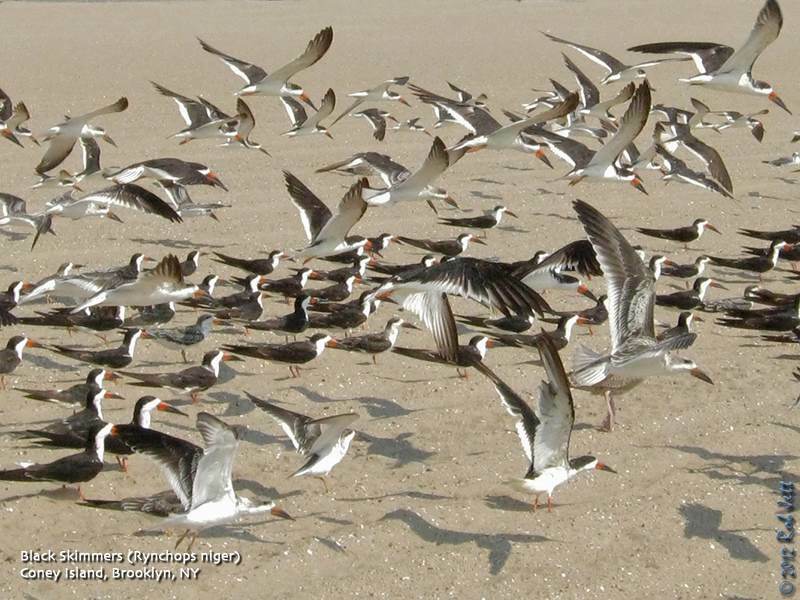 On Tuesday at West End a CASPIAN TERN and 17 LESSER BLACK-BACKED GULLS were noted while a count of LESSER BLACK-BACKED GULLS from Jones Beach West End to Robert Moses State Park on Wednesday produced 27, mostly adults, and over 600 BLACK SKIMMERS were also counted at the West End bar. A CLAY-COLORED SPARROW was spotted at Robert Moses State Park last Saturday and the Sunday flight at Moses also featured YELLOW-BILLED CUCKOO, BLUE GROSBEAK, DICKCISSEL, LINCOLN'S SPARROW and a flyover PINE SISKIN. At Cupsogue County Park in West Hampton Dunes Monday a WHIMBREL joined the lingering 3 MARBLED GODWITS on the flats and a PHILADELPHIA VIREO appeared on Shelter Island Sunday. Out at Montauk a BLUE GROSBEAK and a LINCOLN'S SPARROW were found at Camp Hero at the point last Sunday. Among the other arriving migrants recently have been WINTER WREN, GOLDEN-CROWNED KINGLET and AMERICAN PIPIT. Tomorrow is the official start of Autumn and there are lots of signs that Summer is behind us. One is that the locally nesting Laughing Gulls no longer have the black hood and red bill of the breeding season. In another couple of months you'd be hard pressed to find any along our coast as they will have all departed for warmer climes. Here's another great video from "The Symphony of Science". "A musical investigation into the causes and effects of global climate change and our opportunities to use science to offset it. Featuring Bill Nye, David Attenborough, Richard Alley and Isaac Asimov. "Our Biggest Challenge" is the 16th episode of the Symphony of Science series by melodysheep." Guide: Chrissy Word With Rocking the Boat Launch from Hunts Point Riverside Park and explore the Bronx River aboard a hand-built wooden boat, led by experienced rowers. The Bronx River is the city’s only true river and hosts an abundance of wildlife, including herons and egrets, osprey, and belted kingfishers. Visit restoration sites and learn about the Bronx River eco-system, as well as its social and cultural history. Rowing optional! Limited to 20. $35 for adults, $25 for ages 18 and under. Click here to register! Guides: Tod Winston, Joseph McManus With Friends of Woodlawn Cemetery Meet at the Jerome Avenue Entrance of Woodlawn Cemetery. Join us for a morning birdwalk NYC Audubon's Peter Joost and Friends of Woodlawn's Joseph McManus. Attendees will learn about the birds of Woodlawn and look for fall migrants and year-round residents on the cemetery grounds -- which are home to one of the largest collection of trees in an urban setting in the U.S. Bring binoculars and water. Limited to 15. $20 Click here to register! Walks are for beginners and experienced birders alike. Weather permitting, walks start at 9:30 a.m. unless indicated otherwise. If in doubt, call the trip leader. Please note: all phone numbers are code 516 unless otherwise shown. In most cases, your contacts are the trip leaders. For directions, click sitefinder view. We encourage carpooling where feasable. Saturday, September 22, 2012, 11 a.m. to 1 p.m.
Greetings. This is the New York Rare Bird Alert for Friday, September 14th, at 8:00pm. The highlights of today's tape are AMERICAN WHITE PELICAN, MARBLED GODWIT, BUFF-BREASTED SANDPIPER, BAIRD'S SANDPIPER, POMARINE JAEGER, SUMMER TANAGER, CONNECTICUT WARBLER and CLAY-COLORED SPARROW. Locally a front providing an increase in migrants on Monday has dissipated during the week, and we await the next wave's arrival. The most notable rarity locally remains the AMERICAN WHITE PELICAN, still frequenting the East Pond at Jamaica Bay Wildlife Refuge, where shorebird numbers remain low. Two SORAS were along the phragmites edge at the northwest corner of the pond last Sunday, and an AMERICAN GOLDEN-PLOVER dropped in on the north end flats late Sunday afternoon. In Central Park, the most notable birds were a CLAY-COLORED SPARROW seen late Wednesday and on Thursday near the Loch at the north end, and an AMERICAN BITTERN lingering around Turtle Pond from Sunday through today, but a good variety of other seasonal migrants was also present. The selection featured YELLOW-BILLED CUCKOO; several species of flycatcher including YELLOW-BELLIED FLYCATCHER; PHILADELPHIA VIREO on Monday; various thrushes including GRAY-CHEEKED THRUSH; RUSTY BLACKBIRD, PURPLE FINCH, and LINCOLN'S SPARROW, as well as about 28 species of warblers including TENNESSEE WARBLER, CAPE MAY WARBLER, BAY-BREASTED WARBLER, WORM-EATING WARBLER, MOURNING WARBLER, HOODED WARBLER, WILSON'S WARBLER, and YELLOW-BREASTED CHAT, the latter still present today at the north end. Other local parks have also enjoyed a similar variety, but perhaps the most attention was generated by a vireo found Tuesday at Mount Loretto Park on Staten Island, this apparent immature WHITE-EYED VIREO demonstrating just how difficult separating similar-looking species can be, in this case, from a Bell's Vireo. A more familiar example would of course be critically differentiating yellow-looking fall Warbling Vireos from Philadelphias. A hawk flight over Central Park Monday included over 300 BROAD-WINGED HAWKS and two BALD EAGLES, and the inland ridges are now heating up. Other interesting birds locally included a couple of CONNECTICUT WARBLERS at Alley Pond Park last weekend and one at Calvert Vaux Park in Brooklyn on Sunday. Along the beach there was a CLAY-COLORED SPARROW today at the Lido Beach Nature Center at Point Lookout, a YELLOW-BREASTED CHAT at Robert Moses State Park last Sunday, and a CLAY-COLORED SPARROW at the eastern end of field 2 at Moses Park on Monday. A PHILADELPHIA VIREO was photographed at Sunken Meadow State Park today. At Heckscher State Park last Saturday there were still two BUFF-BREASTED SANDPIPERS and a WESTERN SANDPIPER and a PECTORAL SANDPIPER at the pool in parking lot 7. Farther east, three MARBLED GODWITS have been present at Cupsogue County Park recently, often seen near Moriches Inlet. A WHIMBREL was also spotted there Thursday, and at nearby Pike's Beach a CASPIAN TERN has been joining the ROYAL TERNS there, with up to 70 of the latter estimated this week. Last Saturday at Shinnecock Inlet during the strong winds, a POMARINE JAEGER came down the beach, just beyond the off shore breakers providing nice views, but conditions otherwise only produced one CORY'S SHEARWATER, a PARASITIC JAEGER, and an adult NORTHERN GANNET. Two MARBLED GODWITS and 40 ROYAL TERNS were on the Shinnecock bar Saturday. At the Route 105 and Sound Avenue sod fields north of Riverhead last Saturday there were 13 AMERICAN GOLDEN-PLOVERS, four BUFF-BREASTED SANDPIPERS, and eight PECTORAL SANDPIPERS, with two more GOLDENS off Eastport Manor Road, just north of Route 51. A SUMMER TANAGER was still in Northwest Harbor in a private yard there last Saturday, and five AMERICAN GOLDEN-PLOVERS and a BAIRD'S SANDPIPER were around the Mecox flats Wednesday. Six WHIMBREL were seen Sunday along the shore of Gardiners Bay, along with 84 BLACK TERNS in a feeding tern flock off shore, and an OLIVE-SIDED FLYCATCHER visited Oyster Pond Tuesday. At Montauk Point 12 CORY'S SHEARWATERS were seen off Camp Hero Monday, with four at the Point on Thursday also joined by two PARASITIC JAEGERS, and two YELLOW-BREASTED CHATS were seen at Camp Hero Thursday. 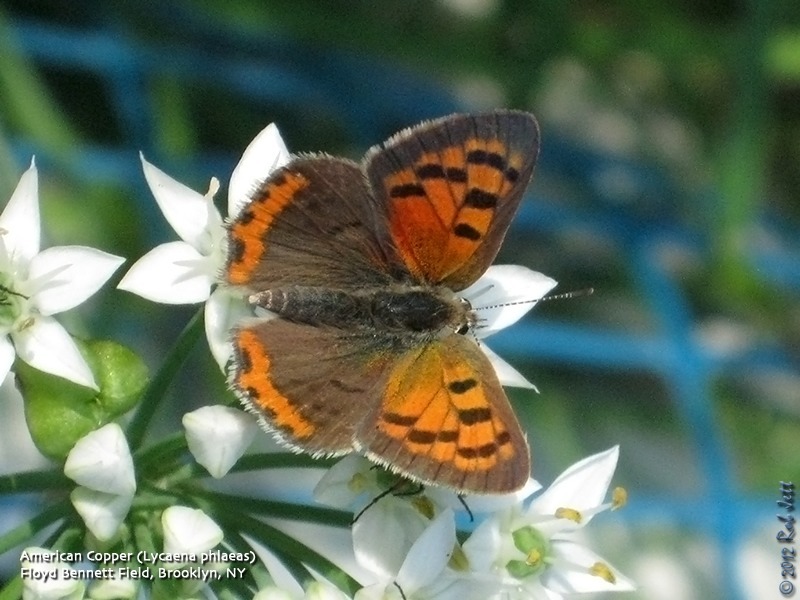 It is very easy to overlook the beauty of the American Copper. This butterfly's wingspan is only about the width of my index finger. With a little patience and a sharp eye, you can find them until the end of September around NYC in disturbed places such as old fields, vacant lots and road edges. 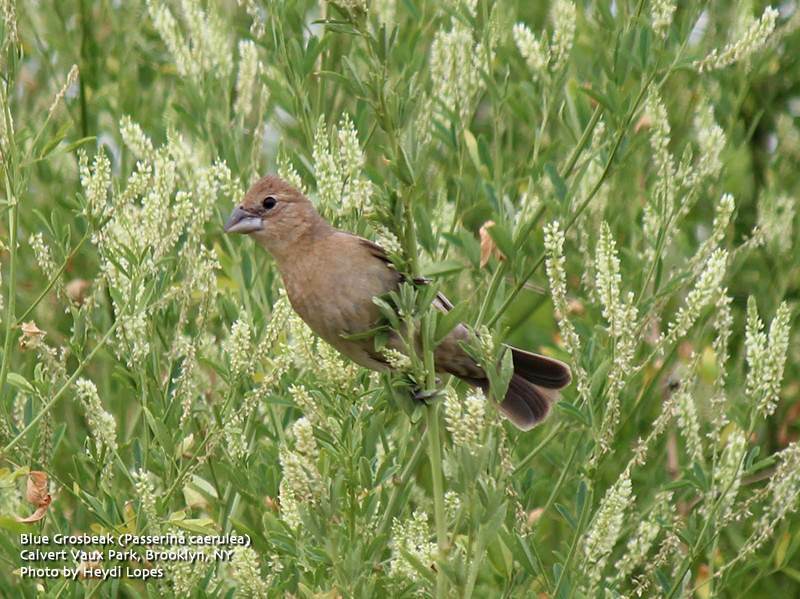 This individual was feeding on flowers at the community garden in Floyd Bennett Field. Don't forget to come check out Fall migration at Green-Wood Cemetery. I'll be leading the weekly trip tomorrow, Wednesday, at 8am. More info here. Take a birding walk through Prospect Park and commune with nature on the 11th anniversary of the September 11th attacks. Meet at Grand Army Plaza (Stranahan Statue) at 7:30 a.m.
Greetings. This is the New York Rare Bird Alert for Friday, September 7th, at 7:00pm. The highlights of today's tape are AMERICAN WHITE PELICAN, AMERICAN AVOCET, BUFF-BREASTED SANDPIPER, BAIRD'S SANDPIPER, WESTERN KINGBIRD, CLAY-COLORED SPARROW, DICKCISSELS, CONNECTICUT WARBLER and other warblers, and RED CROSSBILLS. We have few reports from Jamaica Bay Wildlife Refuge this week, but the AMERICAN WHITE PELICAN was still present on the East Pond at least to Tuesday, and the AMERICAN AVOCET present at least to Monday at the north end of the East Pond. Otherwise, shorebird numbers continue to be rather low. The city parks this week have had some good activity, but it has been falling off recently as we await a new cold front. In Prospect Park, warblers included a female GOLDEN-WINGED WARBLER lingering to last weekend, and a CONNECTICUT WARBLER on Saturday, while others included WORM-EATING WARBLER, MOURNING WARBLER, and HOODED WARBLER. Also noted were COMMON NIGHTHAWK, YELLOW-BILLED CUCKOO, OLIVE-SIDED FLYCATCHER, and YELLOW-BELLIED FLYCATCHER. In Kissena Park in Queens, Monday highlights included two DICKCISSELS, plus such warblers as TENNESSEE WARBLER, PRAIRIE WARBLER, and WORM-EATING WARBLER. Another DICKCISSEL was at Calvert Vaux Park in Brooklyn on Sunday. At Floyd Bennett Field, a BUFF-BREASTED SANDPIPER Tuesday and Wednesday followed a BAIRD'S SANDPIPER from Saturday to Tuesday and WILSON'S PHALAROPE briefly seen on Monday, and a MOURNING WARBLER was among birds in the Community Garden on Wednesday. Last Tuesday on Staten Island, reports included a CERULEAN WARBLER at Clove Lake's Park, and single AMERICAN GOLDEN-PLOVER and BUFF-BREASTED SANDPIPER at Miller Field. At Jones Beach West End Sunday, the DICKCISSEL was noted still around the Coast Guard Station, and a few BLACK TERNS were off shore, with two LESSER BLACK-BACKED GULLS on the beach. We also have a belated report of a WESTERN KINGBIRD, seen briefly in the median, near the Coast Guard Station entrance at the West End, on August 31st. On Wednesday, the count of LESSER BLACK-BACKED GULLS at Robert Moses State Park reached well over 20, with a decent influx noted. Earlier at Moses Park, there were two CLAY-COLORED SPARROWS near the volleyball courts at the eastern end of field 2 and a DICKCISSEL along the western side of the parking lot, these on Sunday. A COMMON RAVEN was seen today in Central Islip, just west of Connetquot River State Park. The sod fields north of Riverhead have been productive lately, even disregarding the temporary excitement that a plate-billed sandpiper caused Thursday, this apparently a poor Semipalmated Sandpiper with a grotesquely distorted bill. These fields are south of Sound Avenue between Doctor's Path on the west and Route 105 on the East. Recently there have been up to 16 BUFF-BREASTED SANDPIPERS and a few BAIRD'S SANDPIPERS on the field, along with other shorebirds including 16 PECTORAL SANDPIPERS today. The AMERICAN GOLDEN-PLOVERS have apparently moved on, though up to 50 were there last weekend, but two Goldens were seen today in the field on the west side of Eastport Manor Road, north of Route 51 in Eastport. A DICKCISSEL was noted at Teddy Roosevelt County Park in Montauk last Saturday. At Marshlands Conservancy in Rye, Westchester County, an UPLAND SANDPIPER visited the adjacent golf course today, and a WHIMBREL has been present on the harbor mud flats all week, with a MOURNING WARBLER there yesterday.